Alrighty. Yesterday after I was at the gym, I walked out into the parking lot and practically fainted. There was a squirrel the size of a freakin housecat. I kid you not. It was one of the funniest things I'd ever seen. I took a picture of it, but I forgot to save it!!! I was so upset. Unfortunately, the picture I posted isn't mine, but I found it online. That's really what he looked like though. I wanted to squirrelnap him and take him home with me, but my parents would've shot me... and him haha I'm sure you guys appreciate it. haha I just love squirrels. They've been my favorite animal for a while now (used to be wolves). Someday when I live alone, I'm gonna have my own damn squirrel farm. How fun would that be? (Yes, I realize I'm insane). As far as food goes, I've been cooking so much lately. I can hardly eat everything I make haha That's a complete lie. Nothing ever goes to waste as long as I'm around. My recipe for today is from Food and Wine magazine. I usually hate that magazine because I could care less about wine. Yeah, I mean, it tastes good and all, but I'd rather read a magazine about building shelves. The recipe is called Lemony Quinoa Salad with Pine Nuts and Olives. I absolutely loved it. I made 2 servings and ate the whole thing. I just couldn't help it. It was really good and the olives just made it come to life. I had to change the recipe a little bit to accomodate myself, but other than that, Food and Wine magazine did a bangin job!! Directions: In a medium size pot, boil the water. Add quinoa, cover, and cook over low heat for 15 minutes, or until al dente. Turn heat off, and allow quinoa to sit with lid on for a few minutes. Transfer to a bowl. In a skillet, toast the pine nuts over medium heat until golden. Add them to the quinoa along with the basil, lemon juice, and olives. I love squrrels too. When I lived in leipzig we used to go to a part for sqirrelwatching. Those guys are really cute! And guess what. I just cooked some quinoa and I have Olives. Your salad sounds divine. Cute post. If I saw a squirrel that big I probably would have taken a picture too. That salad looks delicious. I actually laughed out loud when I saw that picture that squirrel is HUGE!! Aww I love squirrels too! When I drive in the states I freak out because I am so scared that I am going to hit them, lol. And that must ahve been a very very very LARGE squirrel!!! You are not insane! Squirrels are some of the most adorable animals, I don't blame you for wanting to squirrelnap that little (or big) guy! Oh Mr Squirrel is just adorable! I want to squeeze him and love him. And that Salad is just AWESOME Jo! It's making me want it - and I've just eaten! Squirrels are one of the few things that I miss about the US. 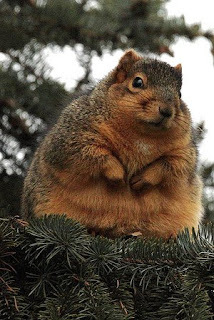 When I went to uni in upstate NY, our campus squirrels were seriously well fed. I saw them eating bagels, pizza, cookies, and one time I saw a squirrel eating an ice cream cone. Someone ate most of the ice cream from the top and threw the cone into the bin (still with ice cream in it, though) and this little squirrel was holding it in his little squirrel hands and eating the ice cream. Crazy! your quinoa salad looks awesome! i lovvve quinoa. haha, that squirrel is hilarious! my sister has a flying squirrel...haha. that quinoa looks SO good!! I think I would have screamed had I seen that squirrel. Good thing it was you and not me. Your salad looks lovely. Aw squirrels!! So cute hehe. I love squirrels. In college, there was one that knew me on sight. I named him BB Nutkin because Squirrel Nutkin is one of my favorite books. I would carry around peanuts for him. Once he started nibbling on my baby toe because he thought it was a peanut. No broken skin, just a light nibbling. The current squirrels near my house are rarely seen tree squirrels that are constantly making shrill noises, which makes my dog bark. I still like them. I need to get a picture so I can figure which of the 2 possible kinds they are. I really wish I could see a flying squirrel - they have them in WA state. I have been really enjoying quinoa lately too. Now I am wondering - why am I only discovering this now?